The general workflow of the M3 Editor can be confusing at first. Why does some data you know is on your M3 seem to be missing? What is the preload file that the user doc for the M3 Editor talks about—do you need to use it? How do you save your work? Even if you've seen Scott Raposa's excellent House 101 Combi Creation Tutorial Series videos, those videos assume that you already understand the basic workflow in the M3 Editor. The easiest way to approach the M3 Editor workflow is to think of it as a "temporary mirror" of the contents of your M3 itself. 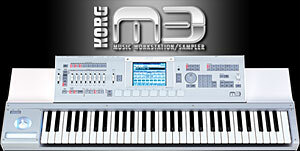 The M3 is where everything lives permanently, and at the start of each editing session you make the M3 Editor match the contents of the M3 by either uploading all current data directly from the M3 into the Editor or by loading a .M3all file into the Editor that was created based on the current data from the M3. Then, when you finish making changes to a program or combi in the editor, you write the changes back into the M3. Rinse and repeat each time you fire up the M3 Editor. Start the M3 Editor and wait for it to finish finding the M3. If you need to work with any KARMA User GEs that you've loaded into the M3, go into Combi or Program mode, and click on the KARMA tab. Then select UTILITY > Synchronize KARMA User GE. If you need to select any EX-USB-PCM multisamples for use in programs that you are designing, first make sure that the corresponding KEP files are loaded into the M3. Then select UTILITY > Synchronize EX-USB Banks. If you need to select any multisamples that you've loaded into the M3 for use in programs that you are designing, select UTILITY > Synchronize RAM Banks. Note: the M3 Editor window doesn't really mirror what you do on the M3 itself, or vice-versa, except to jump to the P0:Play page when you select that page in either place. So you still have to manually navigate in the M3 itself if you're looking for some useful information that isn't in the Editor, such as the useful information on the KARMA RTC tab of the P0:Play tab on the M3. On the M3, navigate to a particular program or combi. The M3 Editor will likewise display all the properties of the selected program/combi. Use the various tabs and sub-tabs in the Editor to create or edit the selected program/combi. As an alternative to step 1, you can click in white LCD display area of the Editor window to choose the desired bank and slot number. Click the various labels in that display area and you'll see how it works. When you have finished making changes to any combi or program, you must write the changes back to the M3 itself. It is also useful to save the current definition of the combi/program on your computer too, in a folder dedicated to all your M3 Editor data. This makes it easy later to arrange all of your individual combis/programs into a specific order in a specific bank when you are getting ready to package your sound set for distribution. Select UTILITY > Write Combination. The editor contents for the combi are written to the M3. In the Save As field, enter a meaningful name for the combi. From the Format drop-down, select Combi (*.M31combi). Click Save. The combi is now in its own standalone file that you can load into any combi bank slot by using UTILITY > Load. By default, the combi will load back into its original bank slot if for some reason you delete it from the M3 itself. Select UTILITY > Write Program. The editor contents for the program are written to the M3. In the Save As field, enter a meaningful name for the program. From the Format drop-down, select Program (*.M31prog). Click Save. The program is now in its own standalone file that you can load into any program bank slot by using Utility > Load. By default, the program will load back into its original bank slot if for some reason you delete it from the M3 itself. The process for initializing the M3 Editor described above requires a lengthy initial Utility > Receive All operation. You can remove this step entirely if you use the following process. Create a new .M3all file with the current contents of your M3. Perform the manual UTILITY > Receive All operation described above in To initialize your editing session to pull the latest and greatest data from the M3 into the M3 Editor. In the Editor, select the GLOBAL section. In the Save As field, enter a meaningful name for these contents of the M3. You're essentially doing the same thing as making a PCG file with Save All on the M3 itself, only you're creating an .M3all file on your computer instead of a PCG file on your M3's USB stick. From the Format drop-down, select All Data (*.M3all). Configure the M3 Editor to automatically load this new .M3all file every time you start the M3 Editor. In the Editor, select the GLOBAL section and make sure you're on the Software Setup tab. Ensure that every checkbox is cleared in the Total Recall & Data Sync Settings section (no checkboxes are selected). It's not exactly wrong or bad to have any of these selected, but any that are will force the corresponding contents of the .M3all file to be pushed back down to the M3, overwriting the target of the checkbox. This might be desirable if you are routinely using the M3 Editor as a plug-in to other DAW software, but it kinda defeats the purpose of using the .M3all file to help start up your editing session faster. In the Auto Load File section, select the Load data file automatically at starting up checkbox. Select UTILITY > Select Auto Load File, browse to the .M3all file that you created in step 1, then click Open. Select UTILITY > Save as Default. Close the Editor and open it again, then check some program or combi bank that is not part of the standard M3 preload data to ensure that it's listed there in the Editor as well as on your M3. Important: This technique does not save the KARMA User GEs, the EX-USB-PCM multisample names, or the multisample names loaded in RAM to the .M3all file. You will always have to manually synchronize those as described further above if you need to use any of this data during an editing session. If you are ever unsure whether you remembered to save everything the last time you finished an editing session, you can just repeat the above process to pull everything from the M3 back into the editor and make the .M3all file again. As long as you keep your M3 "safe" as your bulletproof source for all your current data, it's easy to bring the M3 Editor up to date if needed.